A 1950 work on gunsmithing—the most complete ever written, containing information on every phase of gunwork from selection of the stack blank on through to the metal engraving and blueing. It w thorough!— with not only the "what" and "how" hut also the "why." This work was instigated by the pubiiiher and written at his request by Roy Dunlap with a view of replacing Baker*» Modem Gun*mithiwz% which was written back in 1927. Everyone who has read Dunlap's manuscript says it is "better'n Baker." From general tinkering and repair work by the individual shooter on through to the highest forms of CUftom-gunbuiJdinK: here h practical working knowledge and reliable direction set down in plain, understandable language. You ran find our how to do lucaiius repair, alteration, design and complete construction jobs in the most efficient and economical ways known to expert gunsmiths of long experience. The average user of firearms will find this bcok to be of value in its technical information on barrels, action bedding, accuracy adjustments and trouble correct, tions. The shotgun information is exceptionally complete and practical. Onr ran • read exactly how the job he wants should be done and how to have the guns fitted properly to himself so that he can get the most out of them. Thr targrtshootrr will be interested in :hc chapters on modcxn target rifles, their barreling and chamber work, their special furniture and fittings. Dunlap is a hard-boiled, competent rifleman and hie information on rifles of precision is backed by trial, experience, quite a few medal? and trophies, and many a head of big game. 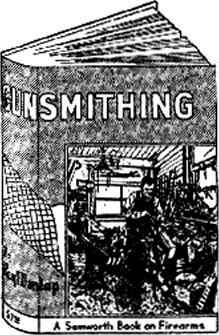 The general gunsmith will gain inhumation he has never been able to find except through trial and error, individual shotguns, rifles, revolvers and pistols arc covcrcd in detail, their weak points mentioned, and instructions given a$ how to fix them without the use of a fully equipped shop and special, expensive machinery'. 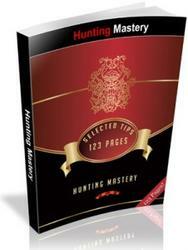 The average individual and general small-shop gunsmith have been kept in mind throughout all chapters of this book. For the lirst time, complete and official cartridge and chamber specification drawings are published, with hcadspacr. data ami barrel threadings, on modern cartridges from the .22 long rifle to the .375, including the more popular wildcats. All barrel shank and thread data is shown by drawings as well as dimensions. Barrel specification» and rifling information in all calibers is listed and analyzed by America's best custom-gunmakers. An extensive chapter and several other portions of the. texr are devoted to the completion of these inlet ted and Remi-finished gunstock blapk* which fcave^ in recent years, become so popular with American riflemen. A chapter is included to covcr the tuning-up, shuoiiitK ancl servicing of die issue ixarand rifle. These pages are replete with technical knowledge of a nature which makes the book invaluable to even those users oi firearms who have no intention of attempting their own gunwork or repairs. This is the one book you will want to keep handy for reference and instruction from now on—entirely original—everything 3pccially written, drawn, or prepared—nothing you have previously read. 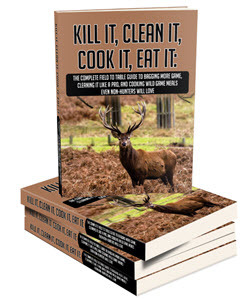 Gunsmitking is sold under the guarantee that it is better and more applicable today than any other publisher: work on that craft. 800 pages—200 illustrations—36 chapters of the most modero, most complete, best all-around book on gunwork ever published. Price $7.50. Gunsmithing methods and textbooks, like everything else, arc matter* of evolution and change for the better. This is particularly true of the many technical books on gunsmithing now in existence—each in part records or augments the gradual but positive progress of the craft. Here is a new work written entirely from the professional outlook and devoted mainly to the repair and modification of existing stock weapons. "Professional Gunsmithing" approaches the subject from an entirely new angle, supplementing and enhancing all other previous Samworth Books on Firearms treating of this vital macter of gun repair and upkeep. 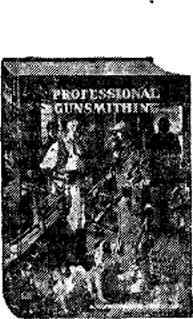 It combines both business and technical phases cf gunsmithing, in that matters such as time, cthics, price estimation, how to deal with shooters as customers, and the idea of doing the job exactly as someone else demands and net as the gunsmith himself might wane to do it, are given paramount consideration throughout the text. How to beat set up a gunshop and what is more important, how to keep it going on a profitable basis is included in this volume. Subjects such as business set-up and customer relationship are presented in a clear, understandable manner. Several specialty lines which will provide a satisfactory source of revenue are included and the listing ofsourc.es of supplies for all gunsmithing materials is the most extensive yet published. Anyone entering the gunsmithing field, cither as a means of livelihood or merely to work on their personal firearms will find a mas? of applicable material herein. The subject of commercial gunsmithing is taken up by Howe in a broad and comprehensive manner, approached from the angle of basic principies and logical reasoning. He tells how to diagnose gun troubles when the weapon b brought in fur icpair and explains the general reasons and causes for necessity of such repairs. By applying Howe's approach" to the problem in hand any gunsmith wijl be enabled to correctly and profitably remedy the fault or repair the defective part. Waller Howe's instruction is concisc and practical because he knows whereof he writes. Specific jobs and types of repair work which have proved to be most frequently brought into the gunshop during his cxpcricncc as a practicing gunsmith, are treated in detail. The amateur will appreciate this instruction as the advice of a master craftsman; the professional will be impressed with its clarity and practical application to the problen^ which daily coufiout him. This book is not a rehash or compilation of material that has appeared in OLher works or titles. It is original throughout and presents material which for some unknown reason has in the pa3t been left for the newcomer to figure out the hard way. Walter Howe's "Professional Gunsmithing," will prove of equal value to the established craftsman or to the beginner. It is today's outstanding: textbook for the gunsmithing profession, 520 psges, 190 special drawings, 21 plates. Price 86.00.